Although I was raised in Christian Science and a regular attendee of Christian Science Sunday School until my twentieth birthday, I had never heard of, or seen, Junior Christian Science Bible Teaching Show until someone left a few links to YouTube videos in the comments of my post Wanna be a sheep! Both Hart’s Vice and LA Record interviews talk about Christian Science. The LA Record interview goes a bit more in-depth and talks about his Sunday School experience, and his puppet work. Jim Henson was your Sunday School teacher? In Mr. Heart’s perspective, the Christian Science Church has a long way to go before it is free of the Devil, or Malicious Animal Magnetism/Mortal Mind as Ms. Eddy liked to call it. However, Mr. Heart seems to have been inspired enough by Ms. Eddy’s teachings to have produced fourteen years of very unique puppetry on public access TV. we feel this is an opportunity to pause with some of our online activities and renew a focus on our primary resources for spiritual growth — our Pastor: the Holy Bible and Science and Health with Key to the Scriptures by Mary Baker Eddy. Fear not little flock, the Circle of Faith blogs will remain up — you’re still welcome to comment there, but the discussion boards? Those will be gone as of August 2014. Christian Science through the lense of not being a part of the Protestant Reformation? Understanding illusory nature of matter is essential and indispensable for Christian Science. An idea of unreality of matter is not a new one. It is as old as Hinduism, or at least 4000 years old. Hindu religion teaches that material world is an illusion – Maya, a dream of mind based on sensory perception. Buddha 500 years earlier than Jesus also taught about the nature of material world. To Western thought unreality of matter can be explained from subject-object frame of reference. If we look at the tree from one side and then change our subjective position, the tree will remain the same even in case subjective picture has changed. The tree can be dry from one side and wet from the other. It can have more branches on visible side, but lack branches on the other. Based on subjective perception, can we say that the tree is dry or wet? Can we count all branches just looking at the tree from one side? What subjective picture of mind can we create on the basis of our sensual perception? With all these delightful variations, interpretations, and legitimate questioning of what Ms. Eddy’s claims, it is no wonder that they’re closing down the forums and limiting comments to CSP-authorized posts. The Christian Science Plaza complex in Boston is in the news, and the column from the Boston Globe is certainly worth the read: “Luxury housing: Don’t just build for Kremlin cronies, global elite” (1). The project at the Christian Science Plaza by developer Carpenter & Co. will make Boston one of only a handful of cities with two Four Seasons hotels. The architects shaped the building in an equilateral triangle with rounded corners, a form that is designed to mirror the geometry of the neighboring Christian Science Mother Church. The development of the property, formerly owned by the First Church of Christ, Scientist, was approved by the Boston Redevelopment Authority last September. My favorite quote comes from the column discussing the tentative new occupants of the luxury condo (1). Fallen dictators who buy condos there may enjoy checking out their former domains in the Mapparium at the Mary Baker Eddy Library. The thought of fallen dictators enjoying the Mary Baker Eddy Library for the Betterment of Humanity makes me smile. I joined The Mother Church at the ripe ol’ age of 12, when good little Christian Scientist kids (the ones that have survived that long) are old enough to join. It was at the second admission of members (there’s two per year) in 1979. I was so proud, so were my parents. I was turning out to be a good little Christian Scientist, despite some doubts I had, even then. I’ll be honest, I wasn’t always a Good Little Christian Scientist. Twelve year old me became a teenager, and I enjoyed some of the things teenagers enjoy, like partying, drinking, drugs, stuff like that. More years went by that I didn’t pay the annual Per Capita Tax ($1.00 US) than when I did. As an adult, the largest donation I sent was $50.00. Sometimes I read the Lesson, more often I just tried once in awhile, or just didn’t. It was a habit I just couldn’t seem to develop. I did go to Christian Science summer camp, and sexually repressed and bigoted Principia College. I was involved with Prin Club, Christian Science youth groups, and I did Class Instruction and Association. I also toiled away for 10 years at The Mother Ship in Boston. Yeah, I put on the appearances. Inside seethed the doubts, just begging to be let out for a walk. My insides were sometimes like the old Cherokee Legend of the Two Wolves–one bad, one good, always in conflict inside all of us. Which one wins? The one you feed. I always tried to feed the Christian Science wolf. Fast forward to a few years ago. I’m grieving the loss of both of my parents, who died miserably from untreated medical conditions because they chose to radically rely on Christian Science (which didn’t do anything for them). I was ripped apart verbally by my Christian Science Teacher for taking my dad [gasp] to the hospital in a bid to save his life. I couldn’t be presented with more stark evidence of the utter failure of Christian Science. Basically, it is bullsh*t. Complete and utter bullsh*t.
I withdrew from my Association, and all other entanglements, and came to the decision I must do the same for my long-standing membership in The Mother Church. So, in 2011, I wrote them a letter, and snail mailed it off (one of probably five things I snail mailed that year). I never got a reply back, and really didn’t give it much thought–it probably got lost by either Canada Post or the US Mail, I figured. Fast forward again to the middle of last year, and my friend and fellow blogger here at Kindism is posting her story of terminating her TMC membership. I realize, “hey, I never got that nice little letter or fistful of CS periodical subscription offers…don’t they love me enough to beg for me to change my mind?” I felt like a jilted lover! I resolved to get that acknowledgement I so craved, but my printer would have none of it. So, the follow-up letter remained trapped on my hard drive, and I once again forgot all about it. Sometime in 2011, I mailed a letter asking to be withdrawn from membership in The Mother Church. I never received a response or confirmation. I would like to confirm that I am no longer a member of The Mother Church. If it turns out that I still am a member, please consider this a formal request to withdraw my membership. I apologize that I do not remember my membership number or have it handy. I am no longer available at either address. Please inform me if you need a current mailing address and I will send it to you. Please acknowledge receipt of this e-mail as soon as possible. Thank you! Oddly, it was a bittersweet feeling. On the one hand, I harbour a deep hatred of Christian Science and what I’ve seen it do to my family and to others. However, I’ve also seen and confirmed the closure of a very big chapter in my life. I feel a bit like an animal that’s been let out of a cage. I revel in being free, but there’s that stupid little part of me that misses the familiar comfort of the cage. So, if you’ve left Christian Science, and wondering about that next step, it’s easy! Just do it! Rip that old band-aid off, and be free! 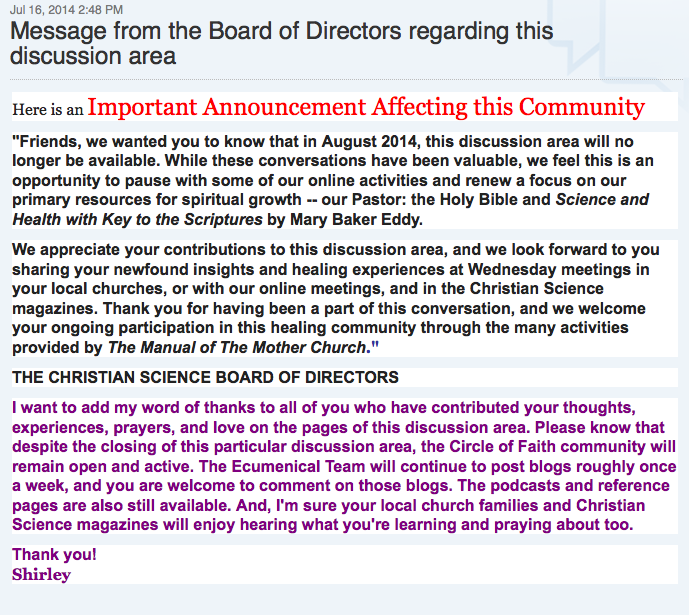 Just e-mail clerk@christianscience.com…I did it…so can you! I was required to take an art history class for my major in college, it didn’t really pertain to my major, but it fell into some outdated requirements so I spent 50 minutes every morning for ten weeks in a dimly-lit, too-warm room, being lectured at (basically a review of the previous nights readings) by a flamboyantly dressed petite woman using staticy microphone. I think we were looking at slides of French impressionist art. We had to write a Big Paper (10 pages or so) for the class so I wrote about how Napoleonic art was state-sponsored propaganda. It was more about history than art, and it did not go over well with my professor. The teacher did not get a good review, I did not get a good grade, and it was the only art-related class I took at Principia. If the Christian Science Church has an art-propaganda movement afoot in how they portray their Beloved Leader, the Discover and Founder of Christian Science, Mary Baker Eddy, I’m going to abide by Halon’s razor, and assume this is not a malicious plot, simply blundering on their part as there are many, many unflattering images of Ms. Eddy on the internet. That said, I don’t doubt that there is a committee of some sort that carefully controls how Ms. Eddy’s image is controlled in official Mother Church literature, propaganda, and Branch Church activities. 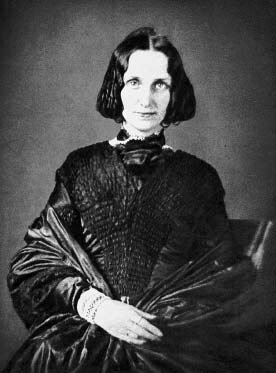 One of the most common images of Ms. Eddy is one of her looking serenely off to the left, white hair neatly tucked away, like everyone’s kindly grandmother (fig 1). This image often hangs in Reading Rooms, Sunday Schools and the occasional church foyer or the preparation rooms of the First and Second Readers. As images of Ms. Eddy go, it is not unflattering, although I am left wondering who, or what she is looking at. The other well-known images of Ms. Eddy come from book-cover art. 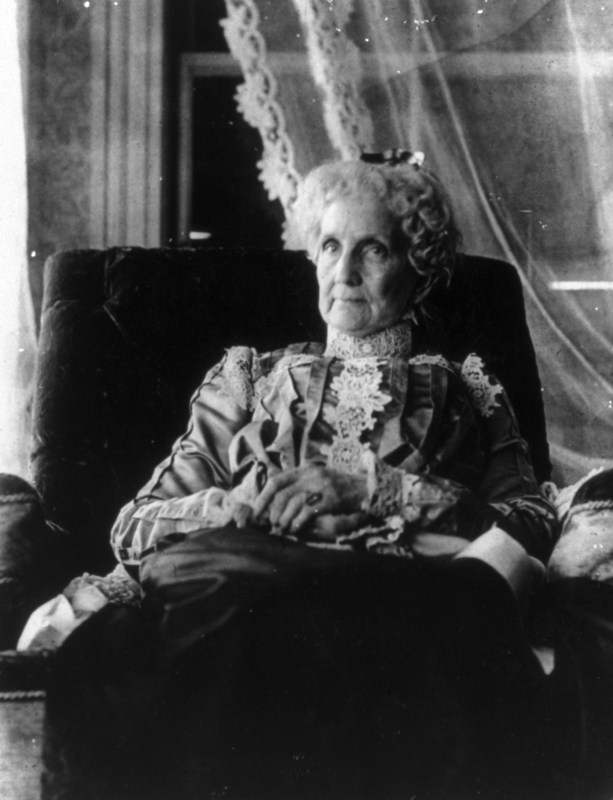 Martin Gardner’s The Healing Revelations of Mary Baker Eddy uses the “determined yet serene woman” (fig. 2) while Stephen Gottschalk’s Rolling Away the Stone uses a variation of the commonly used kindly grandmother theme (fig. 3). It is interesting to note, that in in fig. 3, one of the variations of the “kindly grandmother” theme, Ms. Eddy wears a small crown that was given to her by her students. 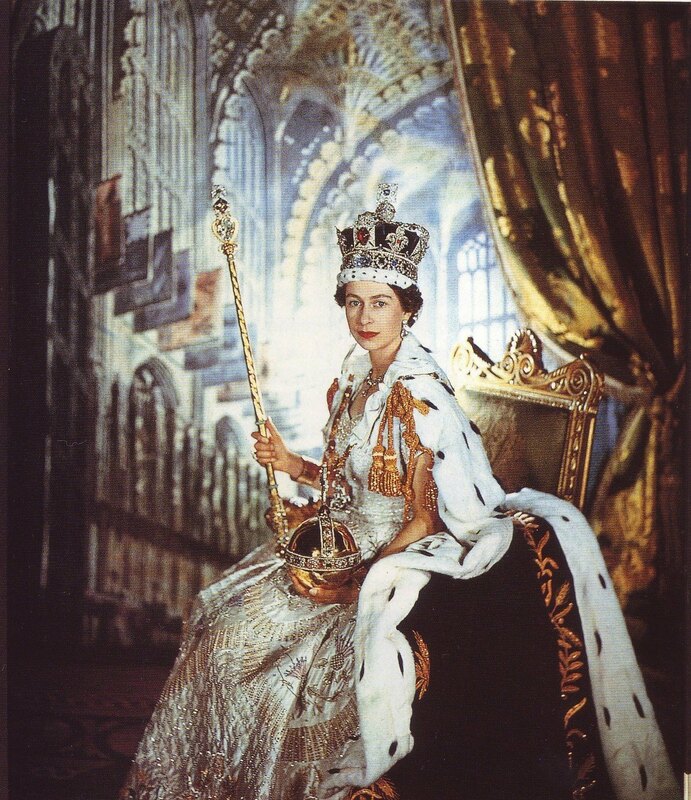 MJSmith, at Ark of Truth-Mother’s Hood has several excellent pieces discussing the crown and it’s role, as well as other symbolism relating to Ms. Eddy, her role as the woman God-crowned in Revelation, and symbolism in Christian Science in general. MJSmith points out that in some copies of Fig. 3, the crown has been removed, however is wearing the crown in the image on the cover of Gottschalk’s book. 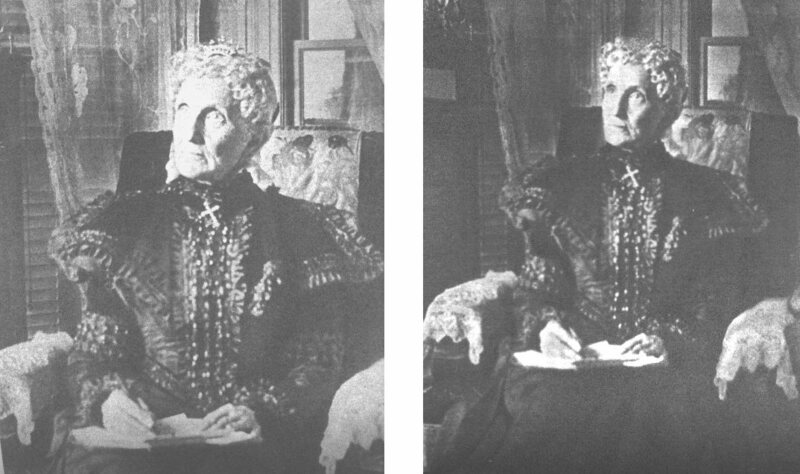 MJSmith talks at length about the disappearance of Ms. Eddy’s crown in Deletion a feign to idolatry and the disappearing and reappearing images of Ms. Eddy’s image in Science and Health in More on Mary Baker Eddy’s picture in Science and Health. There are also excellent articles about the imagery in Christ and Christmas, the stained glass windows of the Mother Church. 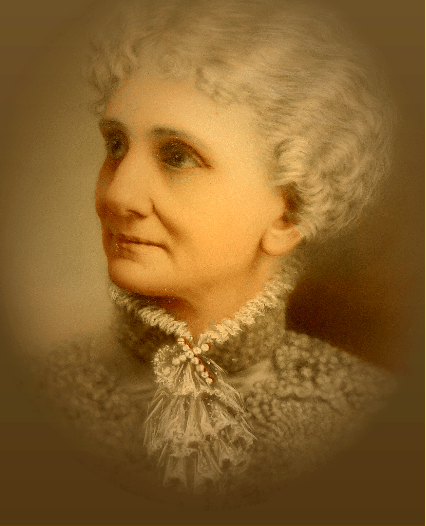 The cover image of Mary Baker Eddy, by Gillian Gill breaks (fig. 4) away from the “determined yet serene woman” and “kindly grandmother” themes. Gill’s book uses a much starker, younger Ms. Eddy, shrouded in a thick black shawl, and oppressive-looking dress, a very different from the image of Ms. Eddy (fig. 5) in her finery. In fig. 5, Ms. Eddy does look like a bit like a leader, political figure, or the Pope greeting the faithful followers, above them all on a balcony, gracing them with her presence. Her hat looks like a crown, and her robes are vaguely royal in nature. In my experience, figures 1 and 2 are the most commonly used by The Mother Church and the Branch Churches. Fig. 3 is a bit too Miss Havisham to be widely displayed. MJSmith would likely disagree, and scream conspiracy! 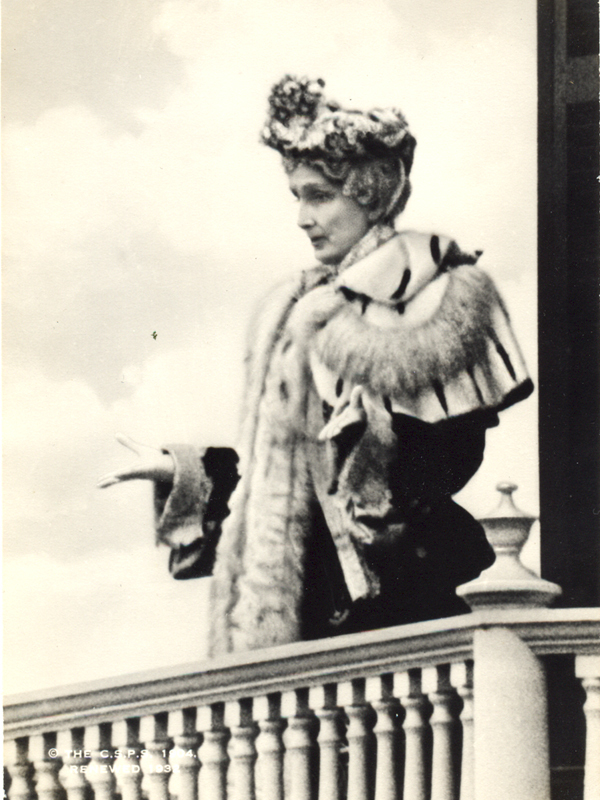 but really, the image of Ms. Eddy with a crown in rather lavish surroundings may be a bit much for anyone but the most devout of Christian Scientist to handle. Fig. 4 has come into wider use solely because of the Gill biography – I will admit, even before my departure from Christian Science, the haunting eyes staring out from the cover have kept it from being added to my collection. Fig. 5 is rather grandiose, and not used quite as often. The Mother Church does their best to portray Ms. Eddy as a simple seeker of truth, inspired only by the Bible. “The Bible was my textbook. It answered my questions as to how I was healed; but the Scriptures had to me a new meaning, a new tongue. Their spiritual signification appeared; and I apprehended for the first time, in their spiritual meaning, Jesus’ teaching and demonstration, and the Principle and rule of spiritual Science and metaphysical healing, — in a word, Christian Science.” (Retrospection and Introspection, p. 25). That she went on to found a religion with headquarters that have prime Boston real estate, several grand homes, influential congressional lobbing group, and made quite a bit of money from her over 400 editions of her “divinely inspired” work Science and Health are unimportant. Fig. 5 shatters the image of Ms. Eddy as a simple seeker of truth, and reminds everyone of her “beloved leader” role.